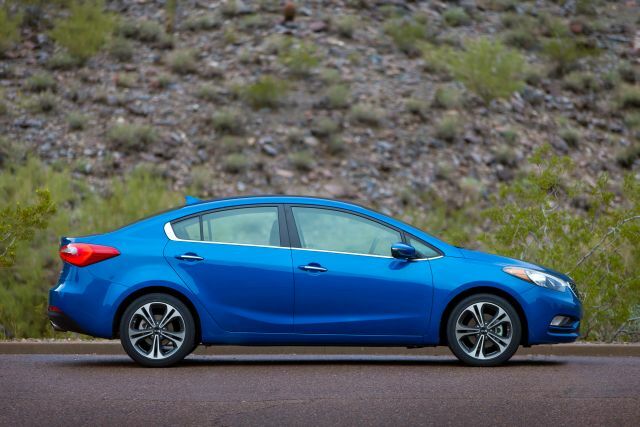 Is better Kia Forte fuel economy on tap for 2015? 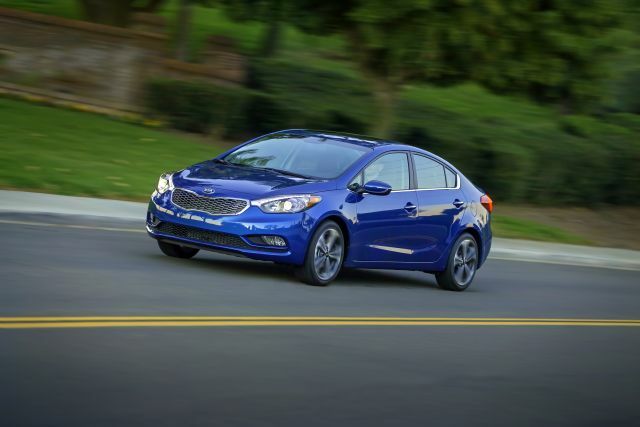 How Will the Forte Sedan, Hatchback, And Coupe Defend Their Value Positioning For 2015? Probably very few because this compact-car lineup was just redesigned for model-year 2014. Expect a nominal price increase for the 2015 Forte four-door sedan, two-door coupe (called the Koup), and Forte5four-door hatchback. And Kia is reportedly working on improving fuel economy for some versions of these cars. Why should I wait for the 2015 model? Why should I buy the current 2014 instead? To get a vehicle that improved on its predecessor in every way. The previous-generation Forte was a bit of a disappointment. It offered lots of features for the money, but a noisy cabin, uninspired ride and handling, and mediocre fuel economy didn’t make it the most compelling choice in the increasingly competitive compact-car segment. The 2014 redesign addressed these shortcomings and introduced much more attractive sheetmetal. Probably not. These automobiles are the handiwork of designer Peter Schreyer. His background includes styling Audis and the Fortes have a hint of German form in their shapes. They also have a variant of the “Tiger Nose” grille that debuted on Kida’s 2011 Optima midsize sedan. It’s the face of the brand, so all-in-all, don’t expect changes to this exterior styling for several years. Highly unlikely, though engineers could tweak things in a quest for greater fuel efficiency. There’s no hint, however, that the near future holds a Forte hybrid, plug-in hybrid, diesel or electric vehicle, or one with all-wheel drive. All will continue with a four-cylinder engine and front-wheel drive. Look for entry-level LX sedan to retain its 148-horsepower 1.8-liter and choice of a six-speed manual or six-speed automatic transmission. The EX sedan, EX Koup, and EX hatchback will return with a 173-horsepower 2.0-liter. A six-speed automatic transmission will be standard on the four-door body styles; the two-door will offer a manual or automatic with this engine. Koup and hatchback will again be available in sporty SX trim, as well. They’ll use a 201-horse turbocharged 1.6-liter and the manual or automatic gearboxes. The sedan and coupe share a basic platform while the hatchback is based on a shorter, European-derived chassis. They’re also similar in basic design, though not styling, to the Elantra from Kia’s corporate partner, Hyundai. Fortes have antilock four-wheel disc brakes and antiskid- and traction-control systems. But such competitors as the Ford Focus, Honda Civic, Mazda 3, and Volkswagen Jetta and non-turbodiesel Golfs have an independent rear suspension while these Kias have a less-sophisticated torsion-beam axle. Will the fuel economy improve? Possibly, but probably just for one engine. The 2.0-liter has room to improve on its EPA ratings of 24/35/28 mpg city/highway/combined with manual transmission and 24/36/28 with automatic. We’d anticipate a 1-3-mpg boost across the board. Otherwise, figure on repeats of 2014 mileage ratings. For the 1.8-liter that would be 25/37/29 and 25/36/29 mpg city/highway/combined with manual and automatic transmissions, respectively. The turbo 1.8 should again come in at 22/29/25 mpg with stick shift, 22/30/25 with automatic. The Forte5 should repeat at 21/29/24 with the turbo and either transmission, though with the 2.0, might improve on its 24/34/28 mpg mark. Probably not, but that doesn’t mean the Forte buyer will want for much. Lots of of features for the money is central to this brand’s identity so that won’t change for model-year ’15. Nor should Kia shy from offering amenities seldom found in this class, such as a cooled driver’s seat, a heated back seat, and a heated steering wheel. The entry-level LX sedan is your basic economy car, but it does come with power heated mirrors, power windows, locks, and mirrors, a tilt and telescopic steering column, SiriusXM satellite radio, a USB input jack, and Bluetooth hands-free connectivity. Cruise control, UVO with a rearview camera, and remote keyless entry with remote trunk release will again be LX options. Most of that list will again be standard on the EX sedan, along with 17-inch alloy wheels and a class rarity, a cooled glove box. The EX also will continue with a broader range of options, including a Premium Package with electrically warmed seats front and rear, a 10-way power-adjustable and ventilated driver’s seat, leather upholstery, power moonroof, pushbutton engine start, and the heated steering wheel. The Technology Package will continue to add a navigation system, xenon headlamps, LED taillights, duel-zone automatic climate control, and the temperature-adjustable rear bench. The Koup and Forte5 will generally mirror the sedan’s equipment levels, though the infotainment interface will be standard instead of optional. All these cars have two rear child-seat LATCH (Lower Anchors and Tethers for Children) positions. They’ll increase marginally but likely remain slightly below those of the opposition, particularly because many charge extra for such features as Bluetooth and USB linking. Estimated base-price range is $16,700-$20,100 for the 2015 Forte sedan, $19,700-$22,300 for the Koup, and $20,400-$22,600 for the Forte5. These figures don’t include options but do include the manufacturer’s destination fee, which should be around $800. Expanded UVO capability. The setup works like many other in-car infotainment systems. You download an app to your smartphone then connect it to the car via Bluetooth or USB. The Parking Minder is one of the standout functions. It takes GPS data from the car and transfers it to your phone so you won’t forget where you parked. However, adding access to Pandora Internet Radio and Facebook would enhance its desirability.